Obsessed with Scrapbooking: Guest Designer Ruthie with Valentine's Treats! Guest Designer Ruthie with Valentine's Treats! This is Ruthie from September Ninth Designs. I am so excited that Joy asked me to be the guest designer on her blog this week! Thank you so much Joy, for this amazing opportunity! Since Valentine's Day is exactly a month away, I thought it would be fun to spend the week sharing some fun Valentine's treat ideas. Today's treat is cute, inexpensive, and a perfect craft that kids can help make. How fun are these lollipop treats? I used my Gypsy to open and size the flower, from the Artiste cart, to 2.25" tall and I hid the circle in the center of the flower. I opened a circle from George Basic Shapes and sized it to .30", placed it in the center of the flower, and then grouped them together. After grouped, I copied and pasted as many flowers as I needed to the mat, so that I could cut them out all at once. 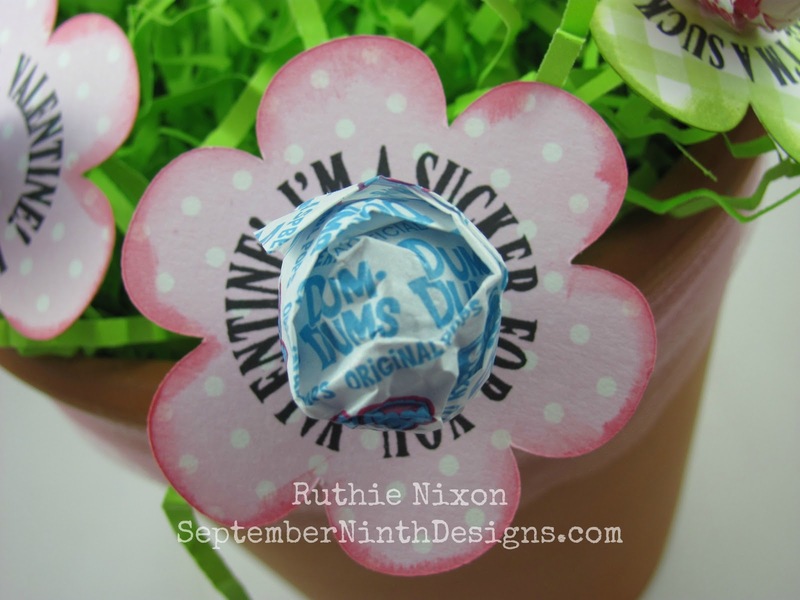 Once all my flowers were cut out, I inked the edges, stamped them in the center with the sentiment, and slipped the lollipop through the center. You could also cut a small leaf and add that as well. That would be a perfect place to add a classmates name. So I thought it would be fun to have a giveaway each day too! Today's giveaway is the My Creative Time stamp set that I used on my project! All you have to do is leave a comment here and on my blog with your contact information and I will pick the winner, via random.org, on Sunday, January 20th and all the winners will be announced on my blog, Monday morning, January 21st. OMG how stinking cute are those little sucker flowers! Great job! I love the lollipop centerpiece. Too cute!! Cute idea! Thanks for a chance to win too! 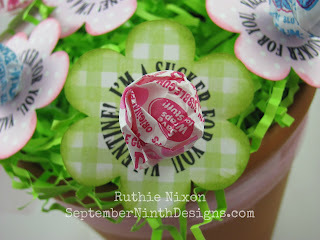 I love this idea...off to explore Ruthie's blog now...thanks! I love this idea! I am going to make these with cake pops instead of lollipops for my grandsons to bring to school. This stamp set would help me with this project! Thanks for the chance to win it. Would love the chance to win this stamp set! Love this project! Great idea for a teacher gift! Super Cute! Love the stamps! So stinking adorable, Ruthie. I love it! Cute idea, I think I may be inspired to do something for Valentines Day. Ruthie's candy flower treats are adorable! Darling project! These would be fun to make for my ATC swap group! I've seen suckers done like this before, but this stamp set makes it even cuter. Thanks for the chance to win! What a cute idea for Valentine's! Thanks for sharing! What a sweet and fun project! Phyllis Johnson said ohh what cute flower sucker treats!!! Would make great Valentine!!!! Man, I wish I was a quarter as creative as you!! very cute valentines! Love the stamps, perfect addition to the flowers! This is super adorable!Put a little Spring into the winter months!I"m thinking Spring, because it's only 12 degrees! Thanks for sharing & a chance at today giveaway! WOW... EACH DAY A GIVEAWAY WOW!!!! Thanks for the chance to win such a great stamp set! Would love to create with this! These are so cute. I am going to make some for my class. Thanks for sharing and for the chance to win. congrats on the guest DT! I can't wait to see what else you come up with this week! Such a cute idea. Def will have to make this. Love Emmas stamps. Thanks for the chance and love the lollipop flower pot. Such a cut and inventive idea. Very cute. I made something similar with tissue paper but it took forever. This looks much neater and quicker. Thanks for sharing! Ruthie! So cute! Love all the stamps, too! These are absolutely the cutest!! I want to make them for my class! Can't wait to see what else you make! New email follower to this blog too! Ruthie this is such a cute treat idea!!! I am loving this idea so much, thank you for sharing and congrats for being chosen as Joy's Guest! Such an ADORABLE idea! !Very Yummy! Absolutely adorable ideas! Just love the fun centerpiece this would make for a Valentine table! Such a cute idea. Thanks for the inspiration. Great idea for my Sunday School class to make and tie to shut-ins! Thanks for sharing the idea! 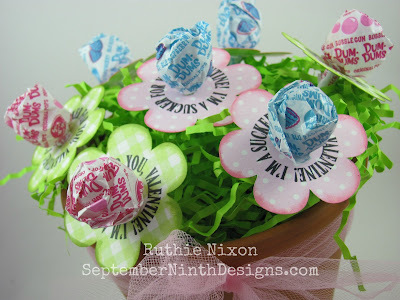 I love these flower pops! Sooo darn cute! Thank you for a chance to win a wonderful det of stamps. Ruthie ~ CONGRATS on the DTing!! Well my sweet friend I think this is soooo CUTE and CLEVER!!! I LOVE how you used my favorite cartridge and that stamp set!!! Genius! Plus my families FAVORITE flavor for those lollipops ~ raspberry! Can't wait to see what you have in store for us this week! This is so cute! Love to win the stamps! 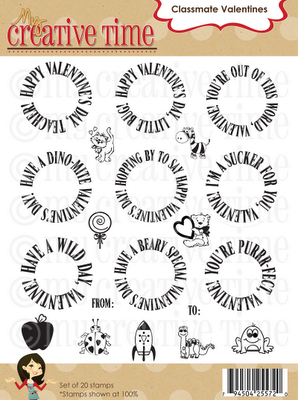 What a great idea for teacher or friend valentines! Oh my goodness, these are just adorable. Makes me wish I wasn't retired from the classroom and could give them to my students. I joined the site to help learn the Cricut Expression 2! I am so over-Joyed with the creativity. Ruthie your lolly-pot is adorable! 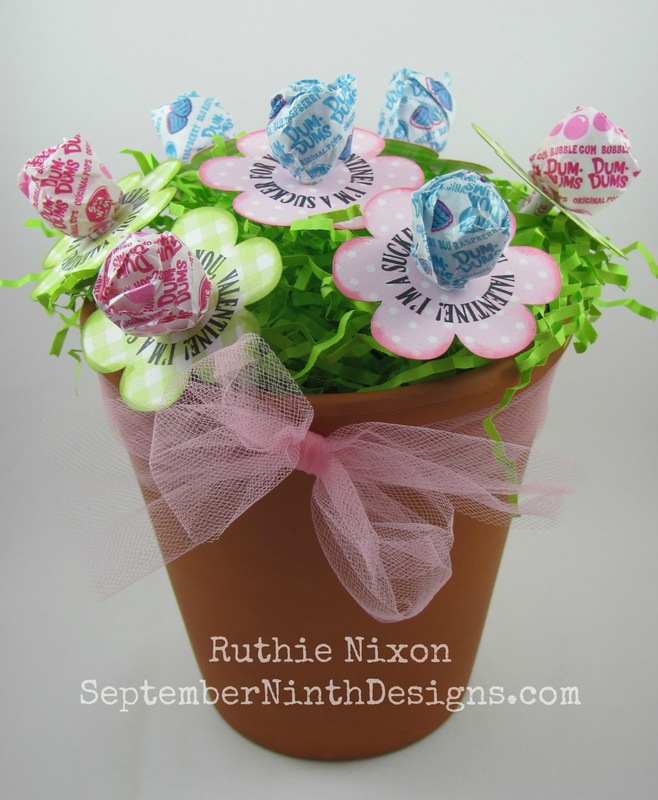 What a clever idea with the dum dums being flowers. That flower pot idea design could be used for so many occasions. Thanks so much for sharing such a wonderful idea. I just love this idea,it's just darling! There are so many possibilities for this.Valentines, Mothers Day,Birthday, Get Well, Thinking of You etc. Great job! Wonderful project. Love, love, love the stamps. My granddaughter would love to make this project. What a cute idea. Would love to win that stamp set. Thanks for a chance to win. What a great idea, love it. Wow! I love the giveaway item this time! I really like using Scotts Quick Dry Glue and this tip would be great to have! Good job on this Valentine's treat. Another idea on what to give in my son's class on Valentine's. Too cute. This would be a great secret pal gift. Oh Ruthie I am loving your sucker bouquet! These flower-pops are adorable!! TFS and for your generosity too! So clever how you designed the tags for the pops! Great idea and wonderful job. What a wonderful project Ruthie! Thanks for the chance. This is such a cute project. Since I don't have small children I would love to make one just to keep in my kitchen over the next month! Super cute idea! Love it! Thanks for chance to win. Great design. Can't wait to make these. Just love them. The stamps are awesome. Sure hope I win. These are way too cute! What a wonderful decor piece too! What a pretty and fun way to present suckers! Thank you for all of your great ideas. This stamp set have been on my Wish List! This is such an adorable project! Thanks for sharing such great inspiration! Cute Valentine flower arrangement. Love the suckers and so will all the kids. Thanks for the great idea Ruthie. Welcome to OWS! I'm so glad to you're here to inspire with your incredible gift ideas! What an adorable idea. Thanks for the chance to win! Oh my goodness those are the best flower/sucker treats. TFS. what a cute idea. tfs. love that stamp set. Way to go Ruthie!!! What a fun Valentine idea..it would be perfect to give a teacher as a bouquet or individually to classmates like you mentione!!! AWESOME, CUT & FUN!!! What cute flowers...love the lollipop idea. Thanks for sharing such cute projects. Beautiful way to dress up your treats!! Perfect bouquet for my kids' teachers. THank you. SO cute!! And so easy! I love this idea for teacher's gifts! Thank you for sharing! These came out really cute! Ruthie this is such a cute idea! I've been trying to decide what to do this year for my daughter's pre-k class, and this is perfect! She loves to press the buttons on my Cricut! This is the cutest Valentine project. My granddaughter will go crazy over this and demand we make them. lol. Thanks for letting me enter. Great job Ruthie! Fabulous art working on this blog i really like it and Its a great fun stuff.